2013 Facility of the Year Award, Facility Integration CategoryBiogen Idec's Flexible Volume Manufacturing (FVM) Project in Research Triangle Park, North Carolina was selected the winner of the 2013 Facility of the Year Award (FOYA) for Facility Integration by the International Society for Pharmaceutical Engineering (ISPE). Working with Biogen Idec, the CRB team provided architectural and engineering services for the entire FVM facility and successfully executed construction management services on the build-out of the cell culture suite. The FVM facility supports Biogen Idec's commitment to developing and delivering effective and innovative therapies to patients worldwide by providing adaptability and flexibility in manufacturing, particularly for early stage clinical products. CRB's unique understanding of the RTP facility, coupled with its expertise in single-use equipment and technologies, led to successful integration of facility and process, superior operational efficiencies and a cost effective solution. "The CRB team's technical expertise on the Flexible Volume Facility was integral to helping us realize our vision of making our Research Triangle Park site one of the most flexible and cost efficient manufacturing operations in the biopharmaceutical industry," said Scott Keetch, Associate Director, Project Engineering with Biogen Idec. "The CRB team's capabilities in disposable manufacturing technology combined with their strong collaborative principles made them a highly effective partner in this successful project." In making the announcement, CRB President Jeff Biskup stated, "Our business is about helping clients be successful in their business. We work hard every day to find resourceful solutions and add value above and beyond what our clients expect. 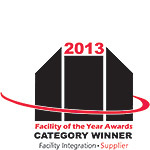 Having our work for Biogen Idec recognized with a Facility of the Year Award affirms we are succeeding. Knowing that our talent and expertise are contributing to our client's success and helping them efficiently and safely bring much needed medications to patients who need them is what drives us." The FOYA program is the pharmaceutical industry's premier awards program dedicated to celebrating innovation and accomplishments in facility design, construction, and operation. A judging panel of senior executives from the pharmaceutical industry selected Biogen Idec's FVM facility from twenty-seven state-of-the-art projects around the globe.